Taj Mahal (From Sanskrit: Tejo Mahalay, "The Great Abode of Tej"), Teja (Jats'1 name of Shiva is Tejaji) + Mahalay (mansion) is a Temple Palace of Lord Shiva located in Agra, India. The Taj Mahal is the finest example of Hindu architecture. Known as one of the Seven Wonders of the world, this magnificent seven storied temple mansion comprises of majestic garden, interior water well, 400 to 500 rooms, 22 apartments, archaded verendahs, terraces, multi stored towers, underground passage, guest rooms, stables, music house, drum chamber, cowsheds, and guard rooms — that necessarily form part of a palace. On the pinnacle of the dome is the Trishul (the trident), red lotus at apex of the entrance, typical Vedic style corridors and the sacred, esoteric letter "AUM" carved on the exterior of the wall of the sanctum sanctorum now occupied by the cenotaphs were of Hindu architecture, built by Hindu craftsmen, with Hindu design. Its marblework is similar to the Amber palace at Jaipur built some six hundred years earlier by Raja Man Singh I in 1592 and completed by Sawai Jai Singh I. During the Mongul rule, this Shiva temple palace had been usurped by Shah Jahan from then Maharaja of Jaipur, Jai Singh. Shah Jahan then remodeled the palace into his wife's memorial. In his own court chronicle, Badshahnama (on page 403, Vol. 1), Shah Jahan states that a grand mansion of unique splendor, capped with a dome, (imaarat-e-alishan wagumbaze) in Agra was taken from the Jaipur Maharaja Jaisingh for Mumtaz's burial. The ex-Maharaja of Jaipur is said to retain in his secret collection two orders from Shah Jahan for the surrender of the Taj building. The Agra city, in which the Taj Mahal is located, is an ancient center of Shiva worship. Its orthodox residents have through ages continued the tradition of worshiping at five Shiva shrines before taking the last meal every night especially during the month of Shravan. During the last few centuries the residents of Agra had to be content with worshiping at only four prominent Shiva temples viz., Balkeshwar, Prithvinath, Manakameshwar and Rajarajeshwar. They had lost track of the fifth Shiva deity which their forefathers worshiped. Apparently the fifth was Agreshwar Mahadev Nagnatheshwar i.e., The Lord Great God of Agra, The Deity of the King of Cobras, consecrated in the Tejo Mahalay (Taj Mahal). The famous Hindu treatise on architecture titled Vishwakarma Vastushastra mentions the 'Tej-Linga' amongst the Shivalingas i.e., the stone emblems of Lord Shiva, the Hindu deity. Such a Tej Linga was consecrated in the Taj Mahal, hence the term Taj Mahal alias Tejo Mahalay. The other name of the emblem was Agreswar Mahadev and it is important to note that from the word Agreswar, the name of the city of Agra has been derived. “The sais Munj Bateswar Edict was laid by King Paramardidev of the Chandratreya dynasty on Sukla Panchami in the month of Ashwin, in the year 1212 Vikram Samvat (or A.D. 1156). … King Paramardidev built two magnificent temples with white marble, one for Lords Vishnu and the other for Lord Shiva and they were desecrated later on by the Muslim invaders. Perhaps a farsighted man took the edict to a safer place at Bateswar abd buries it beneath the ground”. Perhaps, after the said desecration, the temples were no longer used as religious places and due to this reason Abdul Hamid Lahori mentioned them as palaces, not as temples. According to the renowned historian Mr. R. C. Majumdar, the other name of the Chandratreya or Chandel King Paramardidev was Paramal and their kingdsom was known as Bundelkhand, a.k.a. Jejakabhukti2. Today, there are two marble palaces in Agra, one is the Mausoleum of Idmat-ud-Daula, the father of Noorjahan and the other is Taj Mahal, and it is evident from the Munj Bateswar edict that, once upon a time, one of them was the temple of Lord Vishnu and the other was a temple of Lord Shiva. Experts believe that it is the temple of Vishnu that has been made the mausoleum of Idmat-ud-Daula, and the temple of Shiva has been converted into the mausoleum of the queen Arjumand Banu. A few evidences in favour of this conclusion are given below. The Muslims started their rule over India in 712 A.D. with the invasion of Mohammed Qasem. During their rule they looted and destroyed hundreds of thousands of Hindu temples. Aurangzeb himself destroyed 10,000 Hindu temples during his reign! Some of the larger temples were converted into mosques or other Islamic structures. Ram Janmbhoomi (at Ayodhya) and Mathura Krishna Temple (at Mathura) are just two examples. The most evident of such structures is Taj Mahal. Aurangzeb's Letter: Aurangzeb writing to his father Shahjahan within years of completion as to extensive repairs required to the Taj. An English translation of the contents from line 21 of page 402 to line 41 on page 403 of Badshahnama is given below. “Friday, 15th Jamadiulawal, the sacred dead body of the traveller to the kingdom of holiness Hazrat Mumtazul Zamani, who was temporarily buried, was brought, accompanied by Prince Mohammad Shah, Suja bahadur, Wazir Khan and Satiunnesa Khanam, who knew the pemperament of the deceased intimately and was well versed in view of that Queen of the Queens used to hold, was brought to the capital Akbarabad (Agra) and an order was issued that very day coins be distributed among the beggers and fakirs. 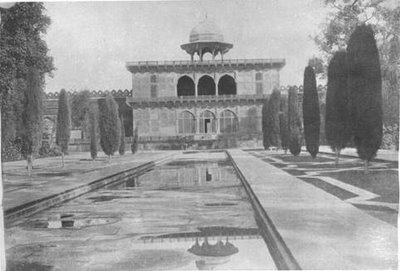 The site covered with a majestic garden, to ther south of the great city (of Agra) and amidst which the building known as the palace of Raja Man Singh, at present owned by Raja Jai asingh, grandson of Man Singh, was selected for the burial of the Queen, whose abode is in heaven. Although Raja Jai Singh valued it greatly as his ancestral heritage and property, yet he agreed to part with it gratis for Emperor Shahjahan, still out of sheer scrupulousness and religious sanctity, he (Jai Singh) was granted Sharifabad in exchange of that grand palace (Ali Manzil). After the arrival of the deadbody in that great city (of Agra), next year that illustrious body of the Queen was laid to rest and the officials of the capital, according to royal order, hid the body of that pious lady from the eyes of the world and the palace so majestic (imarat-e-alishan) and capped with a dome (wa gumbaje) was turned into a sky-high lofty mausoleum”. 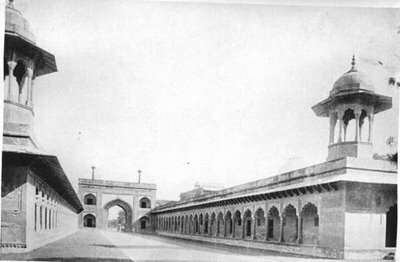 Aurangzeb's letter to his father, emperor Shah Jahan, is recorded in at least three chronicles titled Aadaab-e-Alamgiri, Yadgarnama, and the Muruqqa-i-Akbarabadi (edited by Said Ahmed, Agra, 1931, page 43, footnote 2). In that letter Aurangzeb records in 1652 A.D itself that the several buildings in the fancied burial place of Mumtaz were seven storeyed and were so old that they were all leaking, while the dome had developed a crack on the northern side. Aurangzeb, therefore, ordered immediate repairs to the buildings at his own expense while recommending to the emperor that more elaborate repairs be carried out later. This is the proof that during Shah Jahan's reign itself that the Taj complex was so old as to need immediate repairs. Shah Jahan then remodeled the palace into his wife's memorial. The use of captured temples and mansions as a burial place for dead courtiers and royalty was a common practice among Muslim rulers. For example, Hamayun, Akbar, Etmud-ud-Daula and Safdarjung are all buried in such mansions. Many rooms in the Taj Mahal have remained sealed since Shah Jahan's time, and are still inaccessible to the public. The Rajasthan State archives at Bikaner preserve three other firmans addressed by Shah Jahan to the Jaipur's ruler Jaising ordering the latter to supply marble (for Mumtaz's grave and koranic grafts) from his Makranna quarris, and stone cutters. Jaisingh was apparently so enraged at the blatant seizure of the Tajmahal that he refused to oblige Shah Jahan by providing marble for grafting koranic engravings and fake centotaphs for further desecration of the Tajmahal. Jaising looked at Shah Jahan's demand for marble and stone cutters, as an insult added to injury. Therefore, he refused to send any marble and instead detained the stone cutters in his protective custody. Bernier, a contemporary French visitor has noted that non-muslim's were barred entry into the basement (at the time when Shah Jahan requisitioned Mansingh's palace) which contained a dazzling light. Obviously, he reffered to the silver doors, gold railing, the gem studded lattice and strings of pearl hanging over Shiva's idol. Shah Jahan comandeered the building to grab all the wealth, making Mumtaz's death a convineant pretext. Far from the building of the Taj, Shah Jahan disfigured it with black koranic lettering and heavily robbed it of its Sanskrit inscription, several idols and two huge stone elephants extending their trunks in a welcome arch over the gateway where visitors these days buy entry tickets. Tavernier, a French jeweller has recorded in his travel memoirs that Shah Jahan purposely buried Mumtaz near the Taz-i-Makan (i.e.,"The Taj building") where foreigners used to come as they do even today so that the world may admire. He also adds that the cost of the scaffold-ing was more than that of the entire work. 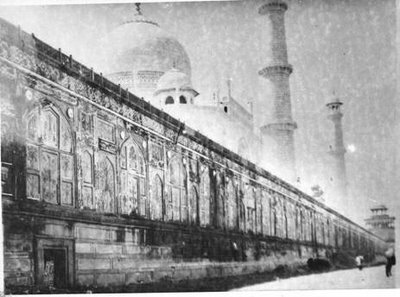 The work that Shah Jahan commissioned in the Tejomahalaya Shiva temple was plundering at the costly fixtures inside it, uprooting the Shiva idols, planting the centotaphs in their place on two stories, inscribing the koran along the arches and walling up six of the seven stories of the Taj. It was this plunder, desecrating and plunderring of the rooms which took 22 years. A clue to the tampering by Shahjahan is found on pages 216-217, vol. 4, of Archealogiical Survey of India Reports (published 1874) stating that a "great square black balistic pillar which, with the base and capital of another pillar….now in the grounds of Agra,…it is well known, once stood in the garden of Taj Mahal". "I arrived at the high walls which enclose the Taje-Mahal and its circumjacent buildings. I here got out of the palanquine and … mounted a short flight of steps leading to a beautiful portal which formed the centre of this side of the "Court of the Elephants" as the great area was called." The Taj Mahal is scrawled over with 14 chapters of the Koran but nowhere is there even the slightest or the remotest allusion in that Islamic overwriting to Shah Jahan's authorship of the Taj. Had Shah Jahan been the builder he would have said so in so many words before beginning to quote Koran. 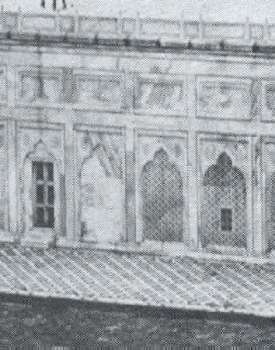 That Shah Jahan, far from building the marble Taj, only disfigured it with black lettering is mentioned by the inscriber Amanat Khan Shirazi himself in an inscription on the building. A close scrutiny of the Koranic lettering reveals that they are grafts patched up with bits of variegated stone on an ancient Shiva temple. The arrangement of the domes, the lotus canopy, the trident pinnacle, the numerous rooms in the building, the direction of the mansion and its triple domes, the "Gow-shala", the "Nagar-khanas," and the surviving Hindu symbolism indicate that it was originally built as a temple complex. Well known Western authorities on architecture like E. B. Havell, Mrs. Kenoyer and Sir W. W. Hunterhave gone on record to say that the Taj Mahal is built in the Hindu temple style. Havell points out the ground plan of the ancient Hindu Chandi Seva Temple in Java is identical with that of the Taj. These arches along the eastern side of the plinth are an indication of the row upon row of rooms total 1089 that lie hidden inside the marble plinth. Trident pinncle: The Tajmahal has a trident pinncle over the dome. A full scale of the trident pinnacle is inlaid in the red stone courtyard to the east of the Taj. The central shaft of the trident depicts a "Kalash" (sacred pot) holding two bent mango leaves and a coconut. This is a sacred Hindu motif. Identical pinnacles have been seen over Hindu and Buddhist temples in the Himalayan region. Tridents are also depicted against a red lotus background at the apex of the stately marble arched entrances on all four sides of the Taj. People fondly but mistakenly believed all these centuries that the Taj pinnacle depicts a Islamic crescent and star was a lighting conductor installed by the British rulers in India. Contrarily, the pinnacle is a marvel of Hindu metallurgy since the pinnacle made of non-rusting alloy, is also perhaps a lightning deflector. That the pinnacle of the replica is drawn in the eastern courtyard is significant because the east is of special importance to the Hindus, as the direction in which the sun rises. The pinnacle on the dome has the word ‘Allah’ on it after capture. The pinnacle figure on the ground does not have the word Allah. Gardens: Description of the gardens around the Taj of Shah Jahan's time mention Ketaki, Jai, Jui, Champa, Maulashree, Harshringar and Bel. All these are plants whose flowers or leaves are used in the worship of Hindu deities. Bel leaves are exclusively used in Lord Shiva's worship. A graveyard is planted only with shady trees because the idea of using fruit and flower from plants in a cemetary is abhorrent to human conscience. The presence of Bel and other flower plants in the Taj garden is proof of its having been a Shiva temple before seizure by Shah Jahan. Yamuna river: Hindu temples are often built on river banks and sea beaches. The Taj is one such built on the bank of the Yamuna river — an ideal location for a Shiva temple. When the Taj Mahal was built, it is claimed that the river Yamuna was half a mile away from the structure, but that the river was diverted to flow alongside the Taj Mahal. The truth of the matter is that the moghul regime lacked any civil engineering skill. Hindu palaces, however, always used to be built alongside the river. Behind the Taj Mahal is a well built and paved river bank (known as a Ghat), used by Hindu royalty for the purpose of bathing. The gateways opening to the rear were later closed. Ganesa Torana: On the main gateway, the entire border at waist-height is decorated with what is called the "Ganesa Torana" (the elephant trunk and the crown can be clearly identified). In the southern entrance to the outer precincts of the Taj Complex (i.e., the Taj Gunj gate facing the main gateway), above the door arch, there is a small arched recess. It is customary in Hindu Forts (for example, the Nagardhan Fort, Nagpur) to place an idol of Lord Ganesa in a similar recess above the main entrance. Could it be that the recess above the Taj entrance also contained a similar idol, which was subsequently removed by the iconoclastic invaders? Sanskrit inscription (known as the Bateshwar inscription) it is currently preserved in the Lucknow museum. It refers to the raising of a "Crystal white Shiva temple so alluring that Lord Shiva once enshrined in it decided never to return to Mount Kailas—his usual abode". This inscription was found within a radius of about 36 miles from the Taj Mahal. The inscription is dated 1155 A.D. and was removed from the Taj Mahal garden at Shah Jahan's orders. Historians and Archaeologists have blundered in terming the inscription the "Bateshwar inscription" when the record doesn't say that it was found by Bateshwar. It ought, in fact, to be called "The Tejo Mahalaya inscription" because it was originally installed in the Taj garden before it was uprooted and cast away at Shah Jahan's command. From this it is clear that the Taj Mahal was built at least 500 years before Shah Jahan. Vincent Smith records in his book titled "Akbar the Great Moghul" that "Babur's turbulent life came to an end in his garden palace in Agra in 1630". That palace was none other than the Taj Mahal. Babur's daughter Gulbadan Begum in her chronicle titled ‘Humayun Nama’ refers to the Taj as the Mystic House. Babur himself refers to the Taj in his memoirs as the palace captured by Ibrahim Lodi containing a central octagonal chamber and having pillars on the four sides. All these historical references allude to the Taj 100 years before Shahjahan. Peter Mundy, an English visitor to Agra recorded in 1632 (within only a year of Mumtaz's death) that ‘the places of note in and around Agra, included Taj-e-Mahal’s tomb, gardens and bazaars'.He, therefore, confirms that that the Tajmahal had been a noteworthy building even before Shahjahan. De Laet, a Dutch official has listed Mansingh's palace about a mile from Agra fort, as an outstanding building of pre-shahjahan's time. Shahjahan's court chronicle, the Badshahnama records, Mumtaz's burial in the same Mansingh's palace. Bernier, a contemporary French visitor has noted that non muslim's were barred entry into the basement (at the time when Shahjahan requisitioned Mansingh's palace) which contained a dazzling light. Obviously, he reffered to the silver doors, gold railing, the gem studded lattice and strings of pearl hanging over Shiva's idol. Shahjahan comandeered the building to grab all the wealth, making Mumtaz's death a convineant pretext. Johan Albert Mandelslo, who describes life in agra in 1638 (only 7 years after mumtaz's death) in detail (in his ‘Voyages and Travels to West-Indies’, published by John Starkey and John Basset, London), makes no mention of the Tajmahal being under constuction though it is commonly erringly asserted or assumed that the Taj was being built from 1631 to 1653. The famous historian Shri P.N. Oak has proven that Taj Mahal is actually Tejo Mahalaya — a shiv temple-palace. His work was published in 1965 in the book, Taj Mahal - The True Story. However, we have not heard much about it because it was banned by the corrupt and power crazed Congress government of Bharat who did not want to alienate their precious vote bank—the Muslims. Stories of Shah Jahan's exclusive infatuation for Mumtaz's are concoctions. They have no basis in history nor has any book ever written on their fancied love affairs. Those stories have been invented as an afterthought to make Shah Jahan's authorship of the Taj look plausible. Historical evidence indicates that the Taj Mahal was already ancient at the time of Shah Jahan. And the discussion upon the architecture leads to the conclusion that the general layout of the Taj Complex resembles a Shiva temple. Apart from Hindu images hidden in the sealed stories it is also learnt that Hindu images are also stored in the massive walls of the Taj. Between 1959 and 1962 when Mr. S.R. 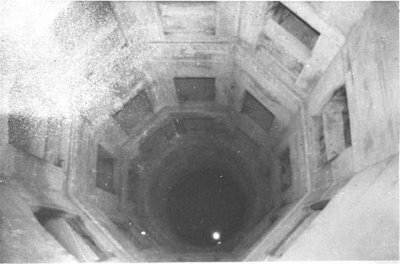 Rao was the Archealogical Superintendent in Agra, he happened to notice a deep and wide crack in the wall of the central octagonal chamber of the Taj. When a part of the wall was dismantled to study the crack out popped two or three marble images. The matter was hushed up and the images were reburied where they had been embedded at Shahjahan's behest. Confirmation of this has been obtained from several sources. Its walls and sealed chambers still hide in Hindu idols that were consecrated in it before Shahjahan's seizure of the Taj. The term Tajmahal itself never occurs in any mogul court paper or chronicle even in Aurangzeb's time. The attempt to explain it away as Taj-i-mahal is therefore, ridiculous. The ending "Mahal"is never muslim because in none of the muslim countries around the world from Afghanistan to Algeria is there a building known as "Mahal". 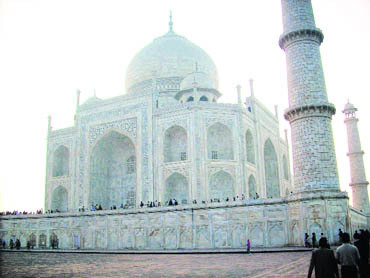 The unusual explanation of the term Tajmahal derives from Mumtaz Mahal, who is buried in it, is illogical in at least two respects viz., firstly her name was never Mumtaj Mahal but Mumtaz-ul-Zamani and secondly one cannot omit the first three letters "Mum" from a woman's name to derive the remainder as the name of the building. Since the lady's name was Mumtaz (ending with 'Z') the name of the building derived from her should have been Taz Mahal, if at all, and not Taj (spelled with a 'J'). Since the term Taj Mahal does not occur in mogul courts it is absurd to search for any mogul explanation for it. Both its components namely, 'Taj' and' Mahal' are of Sanskrit origin. Moreover, if the Taj is believed to be a burial place, how can the term Mahal, i.e., mansion apply to it? Several European visitors of Shahjahan's time allude to the building as Taj-e-Mahal is almost the correct tradition, age old Sanskrit name Tej-o-Mahalaya, signifying a Shiva temple. Contrarily Shahjahan and Aurangzeb scrupulously avoid using the Sanskrit term and call it just a holy grave. No Muslim mausoleum has the facility for circumvolution, but Taj Mahal privides this facility. It indicates that in the pre-Muslim era, devotees used to avail this facility to move round the emblem of Lord Shiva. Tavernier, a French traveller of that time, wrote in his annals that a bazaar used to be held within the Taj complex and it is solely a Hindu tradition to hold bazaars and fairs within a temple complex, which is totally unusual for a Muslim mausoleum. The two buildings which face the marble Taj from the east and west are identical in design, size and shape and yet the eastern building is explained away by Islamic tradition, as a community hall while the western building is claimed to be a mosque. How could buildings meant for radically different purposes be identical? 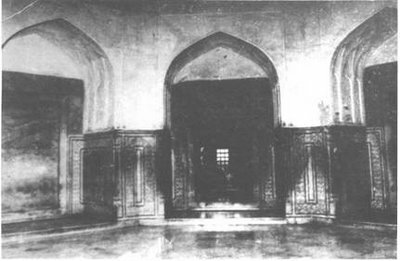 This proves that the western building was put to use as a mosque after seizure of the Taj property by Shahjahan. Curiously enough the building being explained away as a mosque has no minaret. They form a pair af reception pavilions of the Tejomahalaya temple palace. A few yards away from the same flank is the Nakkar Khana alias DrumHouse which is a intolerable incongruity for Islam. The proximity of the Drum House indicates that the western annex was not originally a mosque. Contrarily a drum house is a neccesity in a Hindu temple or palace because Hindu chores,in the morning and evening, begin to the sweet strains of music. The embossed patterns on the marble exterior of the centotaph chamber wall are foilage of the conch shell design and the Hindu letter "OM". The octagonally laid marble lattices inside the centotaph chamber depict pink lotuses on their top railing. The Lotus, the conch and the OM are the sacred motifs associated with the Hindu deities and temples. Between the so-called mosque and the drum house is a multistoried octagonal well with a flight of stairs reaching down to the water level. This is a traditional treasury well in Hindu temple palaces. Treasure chests used to be kept in the lower apartments while treasury personnel had their offices in the upper chambers. The circular stairs made it difficult for intruders to reach down to the treasury or to escape with it undetected or unpursued. In case the premises had to be surrendered to a besieging enemy the treasure could be pushed into the well to remain hidden from the conquerer and remain safe for salvaging if the place was reconquered. Such an elaborate multistoried well is superflous for a mere mausoleum. Such a grand, gigantic well is unneccesary for a tomb. The spot occupied by Mumtaz's centotaph was formerly occupied by the Hindu Teja Linga a lithic representation of Lord Shiva. Around it are five perambulatory passages. Perambulation could be done around the marble lattice or through the spacious marble chambers surrounding the centotaph chamber, and in the open over the marble platform. It is also customary for the Hindus to have apertures along the perambulatory passage, overlooking the deity. Such apertures exist in the perambulatories in the Tajmahal. The sanctom sanctorum in the Taj has silver doors and gold railings as Hindu temples have. It also had nets of pearl and gems stuffed in the marble lattices. It was the lure of this wealth which made Shahjahan commandeer the Taj from a helpless vassal Jaisingh, the then ruler of Jaipur. Peter Mundy, a Englishman records (in 1632, within a year of Mumtaz's death) having seen a gem studded gold railing around her tomb. Had the Taj been under construction for 22 years, a costly gold railing would not have been noticed by Peter mundy within a year of Mumtaz's death. Such costl fixtures are installed in a building only after it is ready for use. This indicates that Mumtaz's centotaph was grafted in place of the Shivalinga in the centre of the gold railings. Subsequently the gold railings, silver doors, nets of pearls, gem fillings etc. were all carried away to Shahjahan's treasury. The seizure of the Taj thus constituted an act of highhanded Moghul robery causing a big row between Shahjahan and Jaisingh. Above Mumtaz's centotaph hangs a chain by which now hangs a lamp. Before capture by Shahjahan the chain used to hold a water pitcher from which water used to drip on the Shivalinga. In the marble flooring around Mumtaz's centotaph may be seen tiny mosaic patches. Those patches indicate the spots where the support for the gold railings were embedded in the floor. They indicate a rectangular fencing. In his book Taj Mahal: The True Story, P.N.Oak says the Taj Mahal is not Queen Mumtaz Mahal's tomb but an ancient Hindu temple palace of Lord Shiva (then known as Tejo Mahalaya). In the course of his research, Oak discovered that Shiva temple palace was usurped by Shah Jahan from then Maharaja of Jaipur, Jai Singh. Oak's inquiries begin with the name Taj Mahal…. He says this term does not occur in any Moghul court papers or chronicles, even after Shah Jahan's time. The term "Mahal" has never been used for a building in any of the Muslim countries, from Afghanistan to Algeria. "The unusual explanation that the term Taj Mahal derives from Mumtaz Mahal is illogical in at least two respects. Firstly, her name was never Mumtaz Mahal but Mumtaz-ul-Zamani, he writes. "Secondly, one cannot omit the first three letters 'Mum' from a woman's name to derive the remainder as the name for the building." Taj Mahal, he claims, is a corrupt version of Tejo-Mahalaya, or the Shiva's Palace. ..Oak also says the love story of Mumtaz and Shah Jahan is a fairy tale created by court sycophants, blundering historians and sloppy archaeologists. Not a single royal chronicle of Shah Jahan's time corroborates the love story. Agra in 1638 (only seven years after Mumtaz's death), describes the life of the city in his memoirs. But he makes no reference to the Taj Mahal being built. The writings of Peter Mundy, an English visitor to Agra within a year of Mumtaz's death, also suggest the Taj was a noteworthy building long well before Shah Jahan's time. Oak points out a number of design and architectural inconsistencies that support the belief of the Taj Mahal being a typical Hindu temple rather than a mausoleum…. Many rooms in the Taj Mahal have remained sealed since Shah Jahan's time, and are still not accessible to the public. Oak asserts they contain a headless statue of Shiva and other objects commonly used for worship rituals in Hindu temples. Fearing political backlash, Indira Gandhi's government tried to have Oak's book withdrawn from the bookstores, and threatened the Indian publisher of the first edition with dire consequences. What is the true architectural origin of this famous site? Marvin Mills is a professional architect who has taught the history and theory of architecture at a number of American universities. Designers of the 17th century Taj Mahal, employed the same unit of measurement used by the Harappan civilization of 2000 BC, according to a new study reported in the latest issue of Current Science. The study by R. Balasubramaniam of the Indian Institute of Technology, Kanpur, has for the first time shown that the unit of length called angulam — mentioned in Kautilya’s treatise Arthasastra dated 300 BC — was used without a break by Indian builders for over 3,900 years until the British imposed their units in the 18th century. The ancient angulam has been found to be equal to 1.763 modern centimetres, according to Balasubramaniam, a professor of materials and metallurgical engineering. He has carried out dimensional analysis of some of India ’s historical structures, built during different times, to identify the measuring units used in their engineering plans.He says he was surprised that angulam and its multiples vitasti (12 angulams) and dhanus (108 angulams) have been used as the unit of measurement right from the Harappan times till the pre-modern era when the Taj was built. Balasubramaniam, who last year studied the dimensions of the 1,600-year-old Delhi Iron Pillar at the Qutub Minar complex, found that angulam and its multiple dhanus were used as the basic units of length in its design. For example, the total height of the pillar is exactly 4 dhanus, adds Balasubramaniam. And now in a paper published in Current Science, Balasubramaniam has shown that the modular plan of the Taj Mahal complex is based on use of grids of sides measuring 60 and 90 vitasti. He says the study has established that the design and architecture of the Taj is based on traditional Indian units codified in Arthasastra and that "there is nothing foreign" in its design. "The fact that the unit of angulam of 1.763 cm could match very well the dimensions of historical monuments establishes the continuity of India’s engineering tradition through the ages for as long as 3,900 years," says Balasubramaniam in his paper. "With the new knowledge we can analyse all the important ancient structures in India ," he says, and hopes the findings "will open a new chapter in the study of metrology (science of measurements)". But how did the angulam tradition remain unbroken for so long? As quoted in the website of Nature India , Balasubramaniam believes the workers from the Harappan days were perhaps using some kind of scale "that was handed over through generations". 1. The people who dominate the Agra region are Jats. The Jat special issue of The Illustrated Weekly of India (June 28,1971) mentions that the Jats have the Teja Mandirs i.e., Teja Temples. This is because Teja-Linga is among the several names of the Shiva Lingas. 1. Taj Mahal: Was it a Vedic Temple?, The Photographic Evidence, A Presentation Assembled by Stephen Knapp, Available at www.stephen-knapp.com. 3. TAJ MAHAL -- A Temple Converted Into A Mausoleum, by Dr Radhasyam Brahmachari, M. Tech, Ph.D.
Was the Taj Mahal a Vedic Temple? The Photographic Evidence, This presents photographs (listed below in two collections) that show the Vedic influence found in such buildings as the Taj Mahal, Red Fort, and other structures in India. The Letter of Aurangzeb, Ordering repairs on the old Taj Mahal in the year just before it is said to have been completed. The Badshahnama, The history written by the Emperor's own chronicler. This page shows how Aurangzeb had acquired the Taj from the previous owner, Jai Singh, grandson of Raja Mansingh, after selecting this site for the burial of Queen Mumtaz.